If they keep coming here for casting, at some point don't the producers of "The Real World" have to choose someone from Ann Arbor? Well, maybe not, but they're taking another shot at it. The current round of open casting calls for the MTV staple includes a date at Bar Louie on Saturday, March 24. 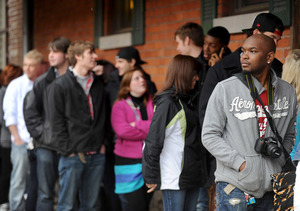 "Real World" hopefuls line up outside Scorekeepers last March. Casting representatives from the cable network's longest-running series will be at Bar Louie, 401 E. Liberty St., from 10 a.m.-5 p.m. Applicants must be age 20 or older and appear to be between ages 20 and 24. Applicants should bring a recent photo. Casting agency Bunim/Murray is also accepting applications online. The show held an open casting call at Bar Louie in October, and also held one last March at Scorekeepers. In 2009, the show had a casting call at the Bistro Bar & Grill. The premise of "The Real World" is to put a group of young adults in a house together and film the results. The show is arguably the first of the modern crop of "reality" TV shows. Casting calls are routinely held at various locations around the country, and there's no guarantee anyone local will be chosen for the show. Current casting is for "The Real World 28." "The Real World 27," set in the Virgin Islands, is scheduled to premiere this summer. Mon, Mar 19, 2012 : 4:11 p.m.
FYI.... Although she is listed as being from Aspen, CO... The Real World: Seattle (1998) featured Lindsay Brien, then a junior at U of M.